Decorate your mantle for DAY 6 of the countdown. I experience absolute bliss every time I unwrap a Christmas present that reveals a TMNT gift. The green guys give me a jolt of holiday cheer. The only rub? Everything is made overseas. Sure, not much is made in American these days. It'd be nice to occasionally support the locals when the holiday season rolls around. Thanks to sites like Etsy, you can do just that. Lots of folks assume the site only offers handmade jewelry and goodies for women, but the Turtles are on there too! 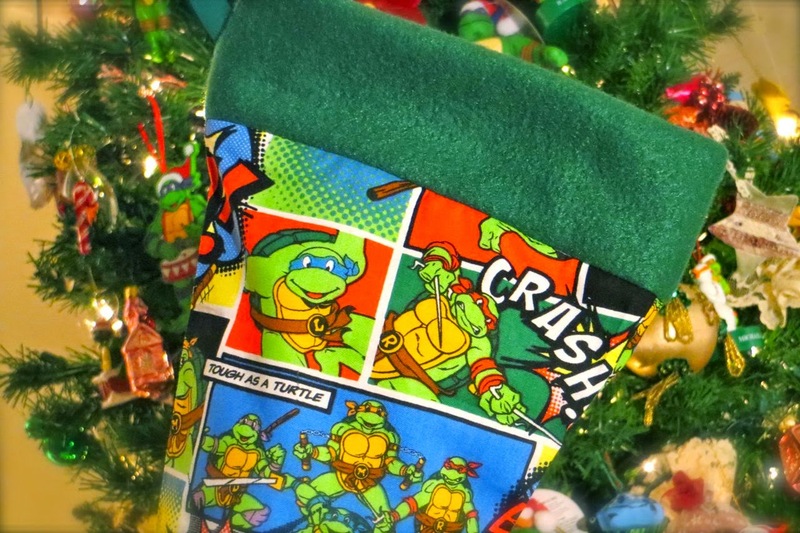 This TMNT stocking from TheLittleBarntique brings handcrafted Turtle Power to your mantel. 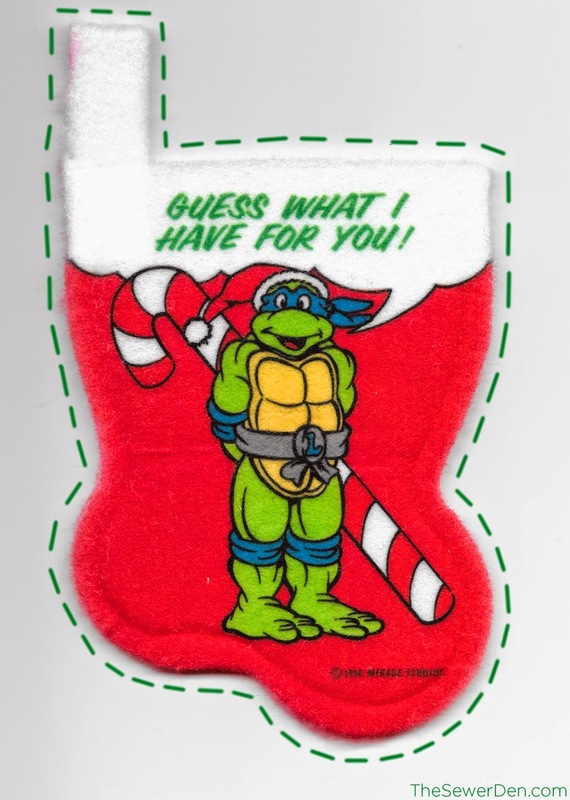 I spotted a TMNT stocking in a Target store this Christmas season and it wasn't nearly this cool. It was constructed poorly, had a lackluster design, and was more expensive! TheLittleBarntique's stocking is sturdy and reasonably priced. The stocking makes a great gift, but there's no shame in snagging one for yourself. 'Tis the season to splurge on yourself! Surf on over to TheLittleBarntique to grab one. Mantels look best when decorated with multiple stockings - especially if they're TMNT-themed. Today's gift is a scan from a mini-stocking showcasing Leonardo from the original cartoon series. In the spirit of American craftsmanship, I recommend you print this little guy onto an iron-on sheet and adhere it to felt to make your own stocking. It makes the perfect decorative companion piece along side TheLittleBarntique's homemade beauty. Check back tomorrow for DAY 7 of 24 Days of Turtle for more festive fun, gracious gifts, and possible prizes! Until then, stay jolly, dudes & dudettes! I love Etsy! I got my Leo costume from someone on Etsy several years ago. Great stocking! That is indeed a sweet stocking!